Interior artwork from Action Comics #980 (May 2017 DC Comics). Art by Patrick Zircher. Hank Henshaw is a fictional supervillain featured in the DC Comics universe, who normally goes by the name Cyborg Superman. While originally featured primarily as an enemy of Superman, he has in recent years also been an enemy of the Green Lantern Corps. At times, he is also referred to as The Cyborg (not to be confused with Victor Stone a.k.a. Cyborg). While the character debuted in The Adventures of Superman #465 (May 1990) and was created by Dan Jurgens, he was reintroduced as the original Cyborg Superman during the Reign of the Supermen storyline following Superman's death. Hank Henshaw, his wife, and their two crew mates are inspired by Reed Richards and the Fantastic Four from Marvel Comics. In both cases there are four astronauts whose shuttle encounters a space anomaly that affects the astronauts. In both cases one crewman each is given powers/changes related to earth, air, fire, and water, the classic four elements. Unlike in the case of their Marvel counterparts, Hank Henshaw, his wife, and the other members of their crew begin to die as a result of their accident in space. Left: Hank Henshaw and the Excalibur crew after being exposed to the radiation. Right: Hank Henshaw as his body decays. Art by Dan Jurgens. Hank Henshaw first appeared as a crew member on board the doomed NASA space shuttle Excalibur in Superman #42, and Henshaw and the other crew members were next seen in Adventures of Superman #465. Hank and the other three members of the Excalibur crew, including his wife Terri, are part of a radiation experiment designed by LexCorp that is affected by a solar flare, causing their shuttle to crash. As a result of their radiation exposure, the human bodies of two crew members were destroyed. However, their minds survived and they were able to construct new bodies out of cosmic radiation and bits of earth and wreckage from the shuttle, respectively. Initially, Henshaw and his wife suffer no ill effects from the radiation (though Hank's hair turns white), and the crew travels to Metropolis in the hopes of using LexCorp facilities to cure their mutated crew mates. During a brief battle with Superman, one crew member, now composed of radiation, becomes unhinged and flies into the sun, thereby destroying himself. By this time, Henshaw's body has started to rapidly decay while his wife is beginning to phase into an alternate dimension. With Superman's help, Henshaw is able to use the LexCorp facilities to save Terri. The remaining member of the shuttle crew commits suicide using an MRI booth to tear apart the metallic components of his body. Though Henshaw's physical body expired, he was able to transfer his consciousness into the LexCorp mainframe. Now able to control technology, Henshaw appears to his wife in a robotic body. The shock of this bizarre rebirth is too much for Terri to bear and in a fit of insanity, she jumps to her death from the nearest window. By this point, Henshaw's electronic consciousness has begun to disrupt Earth's communications networks. Using NASA communications equipment, Henshaw beams his mind into the birthing matrix which had carried Superman from Krypton to Earth as an infant. He creates a small exploration craft from the birthing matrix and departs into outer space alone. Henshaw spends some time traveling between planets, bonding with local lifeforms to learn about the culture and history of various worlds. Henshaw would later come to believe that Superman was responsible for the tragedy of the Excalibur after learning that around the time of the accident, the Man of Steel had thrown a rogue Kryptonian artificial intelligence (the Eradicator) into the sun. Henshaw believes that this created the solar flare that resulted in the Excalibur crew's transformations (although Superman had shared this concern with Terri after he saved her life and she had confirmed that the flares would have been triggered before Superman disposed of the Eradicator). Over time, Henshaw becomes delusional and paranoid, believing that the Man of Steel had intentionally caused the deaths of himself, his wife, and his crew, then driven him from Earth. Arriving on a planet controlled by alien overlord and Superman foe Mongul, Henshaw learns of Warworld and forcibly recruits Mongul as part of a plan for revenge against Superman. Cover of Superman (vol. 2) #79. Art by Dan Jurgens. With Superman apparently dead after his battle with Doomsday, Henshaw decides to pose as him in order to destroy his reputation. To that end, the Cyborg claims to be Superman reborn, the result of the hero's body being pieced together and revived with technology. The Cyborg then uses knowledge obtained from Superman's birthing matrix to construct a body that is genetically identical to Superman. When analyzed closely by Professor Hamilton, the Cyborg passes for the real thing due to components within himself that include Kryptonian alloys, combined with the fact that the replaced body parts correspond with those parts of the original Superman's body that were most severely injured in his fight with Doomsday. After destroying a Superman memorial plaque in front of the Daily Planet, the Cyborg exiles Doomsday into space, prevents a nuclear meltdown, and saves the President of the United States from an assassination attempt. The White House then endorses the Cyborg as the 'true' Superman. When confronted by Lois Lane, the Cyborg claims his memory is "blurry" but he can see a "spaceship on a farm and the name Kent", suggesting that Henshaw may be aware of Superman's secret identity. Henshaw's arrival as Superman, the self-styled Man of Tomorrow, was simultaneous with that of three others: John Henry Irons (the self-styled Man of Steel), Eradicator (the self-styled Last Son of Krypton), and the modern Superboy. The endorsement of the President ensures that the Cyborg eclipses the rest of the heroes claiming to be Superman's heir. During this time, two cults spring up in anticipation of Superman's return from the dead; one that deifies the Eradicator and another that venerates the Cyborg. Supporters of both eventually come to blows over which is the real Superman. This is a foreshadowing of a battle yet to come between the Cyborg and the Eradicator. When an alien ship appears over Coast City, the Cyborg attacks and severely injures the Eradicator, allowing Mongul's craft to destroy the city. The Cyborg also murders an entire family of vacationers trying to find a way out of the devastated area. The Cyborg was then able to convince the White House and the public that the Eradicator was responsible. After tricking and defeating Superboy, Henshaw prepares to launch a nuclear warhead intended to convert Metropolis into a second Engine City. Superboy is able to escape and warn John Henry Irons, Supergirl, and the resurrected but powerless original Superman of the Cyborg's plans. The quartet travels to the site of the former Coast City, and Superman (whose powers are slowly returning), Supergirl, and Steel confront Mongul and the Cyborg while Superboy stops the missile from hitting Metropolis. While Green Lantern defeats Mongul, the Cyborg lures Superman and the Eradicator to the Engine City main reactor and attempts to kill Superman with the Kryptonite that powers the engine. When Henshaw tries to kill Superman with a concentrated blast of Kryptonite radiation, the Eradicator intercepts the blast at the expense of his own life. As the Kryptonite energy passes through the Eradicator, the radiation is altered and acts to fully restore Superman's powers. 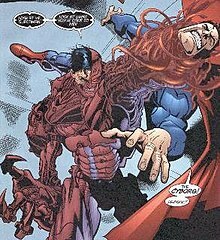 Superman is then able to easily defeat the already weakened Cyborg by sticking his arm through Henshaw's chest, killing him and shattering his body. When Henshaw panics and states that he will "somehow" find a way to come back, a doubting Superman simply says that if Henshaw does, he will be waiting. It was later revealed that Henshaw chose to attack Coast City first because he and his late wife were former residents. This was part of an effort to erase his former life. Before exiling Doomsday into space, Henshaw had installed a device on the monster to allow him to detect if Doomsday were to ever escape. After the destruction of his Cyborg Superman form, Henshaw transfers his consciousness into this device as Doomsday is "the safest place in the galaxy" for the Cyborg to hide. Doomsday is brought on board a space cruiser and, despite frantic efforts of the crew to jettison him, kills the crew, and upon landing on Apokolips, proceeds to pillage the planet. When Superman, his power now boosted by being repowered by "purple Kryptonite", arrives; Henshaw emerges by reconfiguring an armored Apokoliptian trooper, brutally murdered by Doomsday, into a new body (which by all accounts had its DNA overwritten with the Kryptonian DNA Henshaw had obtained while in Superman's birthing matrix, and thus still retains a portion of Superman's abilities and still looks the way the Cyborg Superman looked, except for a change in the color of the Cyborg's metallic components) and proceeds to lay siege to the planet alongside Doomsday. The Cyborg successfully took over most of Apokolips and, despite resisting them once, was captured by Darkseid's Omega Beams during a battle with Superman. Darkseid did not kill the Cyborg; rather, the Omega Effect captured Henshaw in a small orb, with Darkseid planning to use the Cyborg against Superman at a later date. Darkseid eventually frees Henshaw with the understanding that Henshaw is to leave Apokolips and never return. The Cyborg eventually aligns himself with an intergalactic Tribunal which is seeking to bring Superman to trial for the crimes of his ancestors. Henshaw assists the Tribunal in capturing Eradicator, Superboy, Supergirl, Steel, and Alpha Centurion, who had intended to rescue Superman. However, the Cyborg betrayed the Tribunal and attempted to conquer their planet for conversion into a new Warworld. Superman and his allies stop the Cyborg's plan and, when Henshaw's involvement in the destruction of Coast City is brought to the attention of the Tribunal, they find him guilty of genocide and sentence him to death. As an electronic consciousness, Henshaw cannot be killed by normal means and is transported beyond the event horizon of a black hole, where not even light can escape from the gravity. Rather than being destroyed, the Cyborg is transported (unknowingly by another villain, Thanos) to a Marvel Multiverse dimension designated as 616, as seen at the beginning of the Green Lantern/Silver Surfer crossover. The Cyborg destroys a planet in another attempt to recreate Warworld, attracting the attention of the Silver Surfer. Their short battle is interrupted by the arrival of Parallax, who has been tracking the Cyborg for some time, seeking vengeance for the destruction of Coast City. In the confusion, Henshaw escapes and is returned to the DC Universe by the end of the story. Parallax undid the destruction of the planet that Henshaw had caused using power donated from the Silver Surfer. The Cyborg encounters Hal Jordan again at the brink of the Source Wall, a nexus of statues that channels vital energy to preserve the Fourth World. Parallax uses his powers to generate representations of the victims of Coast City, which tear the Cyborg's body apart. Jordan then disperses Henshaw's consciousness, and the Cyborg is seemingly destroyed once again. During a crisis involving the Godwave, Superman (wearing his blue energy costume at the time) travels to New Genesis and encounters Henshaw again. Henshaw has taken part of the Source Wall's structure and crafted a small world made up of his memories, which he uses to taunt Superman before being defeated again. Unknown to Superman, the Cyborg stored his own consciousness in Superman's high-tech containment suit. After Superman returns to Earth, Henshaw escapes and constructs a new body, this time posing as an art teacher at a high school in an attempt to start over. He is a popular teacher and befriends the blind Ashbury Armstrong (daughter of Dirk Armstrong), but ultimately his rage towards Superman causes him to reveal his true identity and his new body is lost in a fight with Superman. To escape detection, Henshaw stores his consciousness in a clay statue. This statue is later stolen by the Toyman and the two villains join forces to kill Superman. To this end, the Cyborg designs a machine that will break Superman's energy form down into multiple components and beam them to different points in the galaxy, preventing Superman from reforming. A malfunction in the machine causes Superman to split into Superman Blue and Superman Red, the latter of whom eventually defeats and recaptures the Cyborg. The Cyborg later attempts to take over Kandor, but fails when he is defeated by Superman and sent to the Phantom Zone. Shortly after the Superman Y2K story, Henshaw escapes the Zone and attacks Superman, who was suffering from Kryptonite poisoning. Henshaw is defeated with the help of the Kandorians and sent back to the Phantom Zone, swearing revenge. However, he is not encountered on subsequent visits to the Zone. Henshaw returns in a form similar to his original body, when he is revealed to be the Manhunters' new Grandmaster. With his influence, the Manhunters have been upgraded with organic material, most notably with blood. On the Manhunter home world of Biot, in sector 3601, Henshaw is holding captive several assumed-to-be-dead Green Lanterns, most of whom appeared to die during the Emerald Twilight saga. Henshaw has also used Kryptonian technology to upgrade the Manhunters. During the Green Lantern story arc No Fear, Kryptonian robots are seen servicing the Manhunters. Henshaw, the Grandmaster, allowed the Green Lantern Corps to rebuild for unspecified reasons as a part of his master plan. While Henshaw explains that he first encountered the Manhunters around the time he was imprisoned in the Source Wall by Parallax, it has yet to be revealed how the Cyborg was able to escape the Phantom Zone and take control of Biot. Henshaw is defeated when Biot explodes, destroying most of his body aside from his head. Henshaw's head is then brought by a Guardian back to Oa so that they can learn of how he was able to take control of Biot, what he has learned from the Manhunters and to learn about "the 52" (referring to the 51 alternate Earths created during the second Crisis as well as their own reality). It is also revealed that the Cyborg knows of the 52, though exactly how he came by this knowledge is not made completely clear. It is stated that he has explored "The Bleed"; the space between dimensions, which could have occurred either when he was imprisoned there, when he was imprisoned in the Source Wall, or in his past exploration of the Marvel Universe. 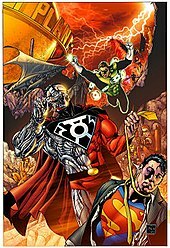 Cover art for Tales of the Sinestro Corps Presents: Cyborg Superman #1, by Ethan Van Sciver. Henshaw's head is taken by the Sinestro Corps after their invasion of Oa to Qward. Henshaw is later seen as a herald of the newly returned Anti-Monitor. He reconstructs his cyborg body and replaces the S-symbol on his chest with the symbol of the Sinestro Corps. He now wields ten Qwardian power rings. It is revealed that Henshaw has joined the Sinestro Corps so that the Anti-Monitor can later kill him and allow him to rest in peace. Henshaw was the focus of the Tales of the Sinestro Corps Presents: Cyborg Superman one-shot that was released on October 3, 2007. In this book, Henshaw and his Manhunters head to Earth to assist the Sinestro Corps in their attack. En route, Henshaw stops leading the Manhunters which continue to their preprogrammed destinations. As he watches them go, he remembers everything that has happened to him, from their dreadful shuttle accident to his wife's suicide when she sees him in his robot form. He finishes this journey down memory lane by going to his wife's grave. He digs her corpse out and rips it into two, shouting that all he wants is not to be with her, but for these memories to fade. Meanwhile, the Manhunters begin an assault on the JLA satellite. Hawkgirl, Black Lightning, and Red Arrow retaliate; however, all three are neutralized when Henshaw assists in the attack and he successfully tampers with the mechanics of the satellite core. As the satellite is thrown out of orbit, Superman appears and engages Henshaw in battle. Their fight continues on Earth, while Sinestro transports his crew and his ship from the anti-matter universe. At first Superman seems to have the upper hand; however after two punches, Henshaw strikes with great power and rage, punching him through the Statue of Liberty. By the end, Henshaw has Superman in a choke hold, thinking that the victory is near. He is later seen briefly in Tales of the Sinestro Corps Presents: Superman-Prime, having presumably been beaten back by the combined strength of Superman, Supergirl, and Power Girl. When the Green Lantern Corps decide to detonate New Warworld and the central power battery of the Sinestro Corps to destroy the Anti-Monitor, Henshaw allows himself to be trapped behind a shield and exposed to the massive explosion. Before he is destroyed, however, he thanks the Green Lantern Corps. Most of Henshaw's body survived the explosion, but it took further damage when Superman-Prime hurled the Anti-Monitor into space. The upper part of his skull was retrieved by the android Manhunters. Unable to detect any life signs and confused without his leadership, the Manhunters reanimated the brain of the Cyborg Superman. He shed a tear when he realized he was still alive. In the Brightest Day crossover, Henshaw would eventually return and work with the Alpha Lanterns as they attempted to augment every Green Lantern, including Ganthet, into an Alpha. This was apparently at the suggestion of the robed figure holding Ion and Parallax, who told him that Ganthet held the knowledge to destroy him permanently, after Henshaw's attempts to provoke Nekron into killing him during the Blackest Night failed because he lacked a heart to attract Nekron's interest. By threatening to make the Alpha Lanterns kill themselves if Ganthet does not cooperate, Henshaw forces Ganthet to work on reversing the augments that turned the Green Lanterns into Alpha Lanterns, hoping that he can use the resulting information to restore his original mortal body. Henshaw was seemingly killed when his lifeforce was finally separated from his nearly indestructible body by the combined full powered blasts of several Lanterns and Ganthet, and appeared on the mental plane of Alpha-Lantern Boodikka in an attempt to take her bio-mechanical body over, where both beings were their original, un-powered selves. Her essence, gifted with her innate, formidable combat skills, engaged his in one-on-one combat, and she quickly overpowered and killed his astral form. Afterwards, however, Ganthet noted immediately that there was something different about her. Boodikka claims this is because Ganthet's newly discovered emotions allowed him to see her as she is (Boodikka's true self, now in control of her body again), not by what she is (an Alpha Lantern). In the Reign of Doomsday crossover, Boodikka was attacked by Doomsday while investigating the remains of New Krypton, and Henshaw was revealed to still be alive inside her, forming a new body out of her internal circuitry to fight Doomsday while Batman and Supergirl were trying to repair Boodikka. Henshaw uses his abilities to take control of the JLA Watchtower and uses the satellite's defenses in an attempt to kill Doomsday, reasoning that if he could manage to destroy the creature that killed Superman, it would prove once and for all that he is superior to Superman. After the creature is violently dismembered by Henshaw, it somehow absorbs the nanotechnology from Henshaw's body and repairs itself, becoming a new being dubbed Cyborg Doomsday. Cyborg Doomsday somehow manages to negate Henshaw's ability to repair himself, which leads Henshaw to believe that he might finally meet his demise. Supergirl bursts onto the scene and attempts to stop Doomsday herself, but Henshaw fires an energy blast at her, stating that he would not allow her to defeat the creature that had humiliatingly beaten him only moments before. With Supergirl distracted, Cyborg Doomsday knocks her out and then tears one of Henshaw's arms off before departing with both of his unconscious captives. Trapped in a satellite with the other Supermen, the heroes conclude that Henshaw has been trapped with them to keep them disorganized due to the tensions caused by his presence, prompting Henshaw to depart and search the satellite himself. After Superman arrives to rescue his comrades, Henshaw reveals that the Doomsdays that fought them were actually all clones of the original created by Lex Luthor. Henshaw tries to fight them, but Superman rips his central node off, knowing that they would not survive a confrontation with the Doomsdays. After the Doomsday clones are sent to another dimension, Henshaw is in custody of S.T.A.R. Labs. In September 2011, The New 52 rebooted DC's continuity. In this new timeline, a fully human Henshaw appears as a doctor working for the Advanced Prosthetic Research Centre and colleague of Caitlin Fairchild. He is tasked into reactivating the android Spartan. While in space and after saving a planet called I'noxia, Supergirl discovers an amnesiac Cyborg Superman living there. This version is revealed to be Zor-El, who survives Krypton's destruction and is reconfigured as a half-human half-machine by Brainiac to be his scout looking for stronger species in the universe. His heart was switched with that of a human to remove his ability to be affected by kryptonite. When the human Henshaw is sent into space on the Excalibur on a long-term mission, he is monitored by the Clark Kent and Lois Lane of the pre-Flashpoint universe, who were trapped in the New 52 world following the Convergence, with Superman seeking to prevent the rise of some of his former adversaries in this world. When the Excalibur crashes after returning from a ten-year journey to Jupiter and back, Superman saves the ship, but is puzzled to see that Henshaw is the only person on board. Taking Henshaw to a base he has established in the Arctic regions to better assess if this Henshaw is a threat or not, Superman is briefly forced to face both Henshaw and a new foe called Blanque, who possesses powerful telepathic and telekinetic abilities and was also kept in the fortress, but once Blanque is focused on fighting Superman, Henshaw helps Superman defeat this new foe with the weapons of a spaceship that was also kept in the fortress. It is later revealed that Henshaw acquired part of an object known as 'the Oblivion Stone' on Jupiter, with Superman forced to face an alien warrior seeking both Henshaw's part of the stone and another part kept in the fortress, but Superman drives her off, Henshaw claiming when questioned that he had no memory of anything that happened on the Excalibur or between it landing and him being discovered. After the reality disruption caused by Mister Mxyzptlk caused the histories of the pre-Flashpoint and New 52 Superman to merge during the DC Rebirth reboot, Henshaw's memories of his past as the Cyborg Superman were restored. With this knowledge, he set out to assemble various old foes of Superman like Metallo, Eradicator, Blanque, and his old 'ally' Mongul to form the Superman Revenge Squad before using the Oblivion Stone to restore his body to the Cyborg Superman state. He even expressed interest into recruiting General Zod to his group. The new Superman Revenge Squad then set out for Kal-El's Fortress of Solitude to obtain the Phantom Zone Projector, still in need of Zod's Kryptonian army to defeat the Superman family. What the cyborg didn't realize was that Zod was using the squad to achieve his own ends. After finding his family trapped within the Zone's confines, Zod betrayed them, leaving Henshaw trapped within the Phantom Zone. He would soon be released by his hated enemy, Superman, on account of an epiphany Clark had while on a time traveling excursion with Booster Gold. To keep the maddened bionic menace docile while he came up with a more humane means of detaining him. Superman gave Henshaw a Kryptonian memory crystal that would pacify the Cyborg Superman's rage by letting him relive his happiest memories in an fantasy world fabricated by his own mind. This self-imposed incarceration would not last, however, as the demented machine man found another means of escape. While he was trapped, a part of his mind escaped into the universe, where he sought to manipulate the Guardians and their appointed intergalactic law enforcement bureau, the Green Lantern Corps, to facilitate his escape. Even trapped within Superman's Kryptonian dwelling, Henshaw was able to influence the central power battery back on Oa a universe away. From within his cell, he orchestrated a mystery surrounding the death of a Guardian to find a powerful weapon, the Phantom Ring. After hacking into the Lantern ring network, Henshaw used the unsuspecting corpsmen Simon Baz, to break the Cyborg out of the Fortress of Solitude and deliver him the Phantom Ring. Hank Henshaw is a "technomorph." Unlike a simple technopath which can physically manipulate technology with their mind, Henshaw can extend his consciousness into any machine. Through his technomorphing ability, Henshaw also gained Kryptonian powers similar to Superman, while editing out weaknesses such as vulnerability to kryptonite. He can even commandeer complex alien technology such as power rings, controlling and assimilating the energy fueling the rings and their batteries. Hank Henshaw appears in the first arc of Smallville Season 11, a comic book continuation of the television series Smallville. Henshaw, depicted as a heroic pilot that Lex Luthor sends to pilot his new anti-alien Guardian Defense Platform, nearly dies when the Guardian Platform blasts its weapons inside the shuttle, causing a dangerous radiation leak. Superman rescues the crew (along with Hank's wife, Terri), but Hank gets the radiation-spewing shuttle safely away so civilians will not get injured by it crashing. Superman gets him out as soon as he can, but he is left covered in third-degree burns and suffering from locked-in syndrome. Henshaw tried to kill Lex, but Terri managed to convince him that it was Superman's fault (as he hadn't managed to save him in time, despite previously having moved a planet). So, when Superman appeared, Henshaw began to fight him in his new S.T.A.R. Labs robot body. The two fought for a few minutes, until Superman separated the head of Henshaw's robot body from the rest of the drone. Afterwards, Henshaw calmed down and apologized to Superman. His head was placed in secure storage at S.T.A.R. Labs. Over the next few months, Henshaw became close friends with Tess Mercer (who had recently had also had her consciousness uploaded into a computer), who would frequently visit him. Due to his own experiences, Henshaw urged her not to waste this second chance. Henshaw remained at S.T.A.R. Labs until Eclipso attacked the city. Superman had been sent to another universe, leaving the city defenseless. Henshaw broke out and made himself a new robot body. He joined forced with Supergirl (Kara Zor-El) and Superboy and fought Eclipso. After the defeat of Eclipso, Henshaw took it upon himself to get the Eclipso diamond away from Earth. With the help of the Green Lantern, Henshaw was sent deep into space towards an unknown destination. Hank Henshaw also appears in the Elseworlds story, JLA: Act of God. In the crossover story Superman vs. The Terminator: Death to the Future, Henshaw learns of the existence of Skynet in the future and uses a salvaged Terminator skull to provide Skynet with information on Superman's weaknesses, subsequently allying with a T-X unit to eliminate John Connor and the Superman Family. Despite Henshaw merging with the T-X to battle Superman, he is forced to withdraw when Supergirl infects the hybrid with a computer virus developed by Lex Luthor to use against the Terminators that damages the T-X beyond repair. In the Legion of Super Heroes episode "Message in a Bottle", a Superman robot that resembles the Cyborg Superman appears as the property caretaker of the Fortress of Solitude in the 31st century and is voiced by Yuri Lowenthal. Hank Henshaw appears in the series Supergirl, portrayed by David Harewood. This version of the character is a former CIA agent who is the head of the Department of Extranormal Operations (DEO). Hank Henshaw places the DEO on high alert when Supergirl reveals herself, worried that her otherworldly abilities pose a threat to humankind. In "Human For a Day", Henshaw reveals to Alex that he is really J'onn J'onzz, an alien refugee. The original Henshaw was obsessed with killing him, and Danvers sacrificed himself to stop Henshaw; J'onzz avenged Danvers' death and took Henshaw's form to ensure humane treatment of aliens by the DEO as well as to watch over both Danvers' daughters. In "Manhunter", it is revealed through flashbacks that the real Henshaw had a prejudice against all aliens, seeing them all as dangerous and untrustworthy, and had founded the DEO to hunt them all down. When Henshaw learned of the Martian Manhunter, an alien from Mars who was seen as the world's most powerful man by even Superman himself, he sent a group of DEO agents including Jeremiah to Peru to hunt him down. Danvers became separated from the group and finds J'onn himself, befriending him upon realizing his true, harmless nature. However, Henshaw was soon informed of Jeremiah's disappearance and tracked him down, discovering him talking to J'onn near a makeshift campfire. Shooting J'onn with a stun gun, Hank attempted to apprehend him, ignoring Jeremiah's pleas and insistence that J'onn was not dangerous. Realizing that Hank was too obsessed with hunting J'onn for his own good, Jeremiah tackled Hank and the two rolled dangerously towards a nearby cliff while wrestling for Hank's weapon. In an attempt to force Danvers to let go of the stun gun, Henshaw fatally stabbed him with a jungle knife, but Jeremiah managed to pull the stun gun from Hank and shock him, causing Hank to fall down the cliff to his death, although his corpse is never actually seen. In the same episode, it is implied that Hank worked with Project Cadmus. In "The Darkest Place," Hank Henshaw is revealed to be alive and has become Cyborg Superman. At the end of the episode he ends up in the Fortress of Solitude inquiring about Project Medusa. In the episode "Medusa," he attacks Mon-El outside a bar and later gets involved in a fight with Martian Manhunter. He later resurfaced, having masterminded alongside Lillian Luthor Metallo's escape alongside Lillian's own escape, as well as later doctoring security footage showing him stealing synthetic Kryptonite by making it seem as though Lena Luthor had been responsible for the theft and smuggling in of the heart. He ultimately escaped alongside Lillian after Metallo underwent a meltdown from the synthetic Kryptonite heart becoming unstable via chopper. In the episode "Homecoming," he destroys a train track as to escape the DEO. DC's direct-to-DVD movie Superman: Doomsday, based on "The Death of Superman" storyline, features a variation on the Cyborg Superman character. One of the many changes is a streamlined cast which cuts the four Superman imposters, including Henshaw. Elements from three of the four impostors (Henshaw, Superboy, and the Eradicator), were combined into the Superman clone created by Lex Luthor in the film. Henshaw is portrayed by Elijah Wood in the 2011 short film The Death and Return of Superman. In the 11th installment of the DC Animated Movie Universe, The Death of Superman, he appears in the beginning in human form, where his Excalibur shuttle is destroyed by the asteroid carrying Doomsday to Earth, and in the last post-credit scene as Cyborg Superman. He is voiced by Patrick Fabian. Henshaw returns prominently in the sequel Reign of the Supermen as the main antagonist, with Patrick Fabian returning as his consciousness and Jerry O’Connell as his new alter ego Cyborg Superman. Unlike the original storyline, where Henshaw essentially created his new body himself and had forcibly recruited Mongul as his associate, here Henshaw is presented as a brainwashed minion of Darkseid, who sent Doomsday to Earth to weaken the Justice League. Upon recovering the remains of Hank Henshaw, Darkseid resurrected him back and transferred Henshaw's consciousness into a cyborg body while indoctrinating him to resent Superman's failure to save the shuttle. After the Justice League is apparently killed saving the U.S. President's life from Parademons, Henshaw tricks Metropolis into letting him create a group of cyborgs who are actually brainwashed into his drones, the 'drones' eventually coming together to create a Boom Tube that will allow Darkseid to dispatch his forces to Earth en masse. Fortunately, the other three Supermen are able to revive the original and bring him back to Metropolis, where Superman engages Henshaw in battle while Steel, Superboy, Lois and Luthor bring back the Justice League from the dimension they were banished to. Henshaw nearly kills Superman as they fight in the Justice League's new Watchtower, but Lois is able to give Superman a boost by lowering the satellite's sun shields, allowing Superman to damage Henshaw. But Henshaw's regenerative systems make him almost indestructible, forcing Superman to stab Henshaw in the head with a crystal containing the essence of the Eradicator, which apparently 'deletes' Henshaw's consciousness. Cyborg Superman is a playable character as one of the Supermen included in the SNES & Genesis video game The Death and Return of Superman in 1994. He is also the final boss of the game. Cyborg Superman appears as a boss character in 2002's Superman: The Man of Steel. Cyborg Superman appears in Injustice: Gods Among Us, voiced by George Newbern. He appears as a downloadable alternate skin for Superman and has Regime Superman's dialogue. Henshaw also appears in DC Universe Online in the ninth DLC, "War of the Light Part I". As a hero, you fight him and Sinestro in "Assault & Battery", and again as a boss in "Mist Recovery". As a villain, he assists the players in collecting Mist and fighting Kyle Rayner in "Mist Recovery". Cyborg Superman appears as a playable character in Lego Batman 3: Beyond Gotham, voiced by Travis Willingham. British radio producer Dirk Maggs produced a Superman radio series for BBC Radio 5 in the 1990s. When the "Death of Superman" story arc happened in the comics, Maggs presented a faithful but streamlined version of the tale, featuring Stuart Milligan as Clark Kent/Superman, Lorelei King as Lois Lane, and William Hootkins as Lex Luthor. American actor Kerry Shale was cast as the villainous Henshaw and as Superboy. The story arc was packaged for sale on cassette and CD as Superman: Doomsday and Beyond in the UK and as Superman Lives! in the USA. During the DC/Marvel crossover Green Lantern/Silver Surfer: Unholy Alliances, Henshaw is briefly shown in the Marvel Universe, having destroyed a planet due to the tidal stresses generated when he tried to convert it into a new Warworld. He is confronted by the Silver Surfer, who once spared the planet when he acted as a Herald to Galactus. Henshaw is intrigued at the Surfer's reference to Galactus' power, but the fight is interrupted by Hal Jordan-currently Parallax-seeking revenge for Henshaw's destruction of Coast City. It is later revealed that Thanos was responsible for Henshaw's appearance in the Marvel Universe; having discovered the multiversal rift created by the destruction of Oa, Thanos plucked Henshaw from the DC Universe to test the rift, later sending Terrax to the DC Universe to test Kyle Rayner as part of his plan. In the subsequent crossover Superman/Fantastic Four: The Infinite Destruction, Reed Richards and his team are forced into an uneasy alliance with Henshaw when Galactus kidnaps Superman and transforms him into his Herald. In conversation with Susan Storm, Henshaw points out the "ironic" similarity between his origin and the FF's. Eventually, Superman is released from his position as Herald when his will proves to be stronger than Galactus' reprogramming, due to the sheer scale of the impact that Krypton's destruction has had on him as a person. The story concludes with Galactus blasting Henshaw with a ray that turns him into a simple metal rod in response to his pleas for perfection, after the discovery that Henshaw was responsible for Superman coming to the Marvel Universe; Henshaw sent Superman a fake message from Jor-El to suggest that Galactus was involved in Krypton's destruction, seeking the power of becoming a Herald after learning of Galactus in his encounter with the Surfer. Hank Henshaw appeared in issue #19 of the Batman: The Brave and the Bold comics. Batman had to work with the Green Lantern Corps to keep Hank Henshaw from killing Hal Jordan. ^ a b c d Wallace, Dan (2008). "Cyborg Superman". In Dougall, Alastair (ed.). The DC Comics Encyclopedia. New York: Dorling Kindersley. p. 91. ISBN 0-7566-4119-5. OCLC 213309017. ^ "'Supergirl': Chyler Leigh, David Harewood". The Hollywood Reporter. February 26, 2015. ^ Mitovich, Matt Webb (October 31, 2014). "CBS' Supergirl Casting Jimmy Olsen, Cat Grant and Others". TV Line. Retrieved October 31, 2014. ^ "DVD Talk Review: Superman - Doomsday". Dvdtalk.com. Retrieved 2011-01-30. ^ on. "DC Universe Online". DC Universe Online. Archived from the original on 2014-02-02. Retrieved 2015-10-27. This page was last edited on 3 April 2019, at 00:45 (UTC).